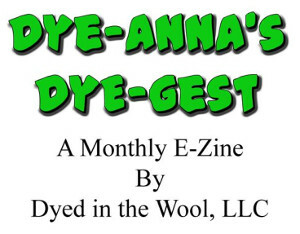 Not too long ago I joined the Southern Knit Bloggers webring. Ever since then I’ve been acutely aware that I’ve made very few knitting posts! :o So here's another. I really and truly love to knit; I just don’t do it much in the summer. It’s too darn hot to have a knitting project in my lap. I always keep a pair of socks on needles however, just to pass the time and keep my hands busy. This is what I have to show today. 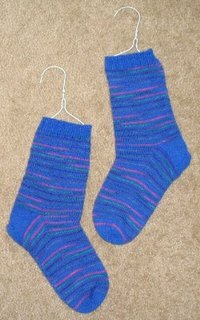 The handy dandy sock blockers are an idea from The Knitting Zone. The pattern is quite different from any toe ups I‘ve knit before, as it features a Turkish cast on toe and a reverse Dutch heel. The toes were quite a trick as they required 2 circs to cast on with. It took me several tries, but it does make a nice toe. I would have taken pictures of the process, but I started these socks before I started blogging. The reverse Dutch heel was new for me as well. Usually I work short row heels, but for these a flap was knitted and then a gusset. My only problem was a gape. 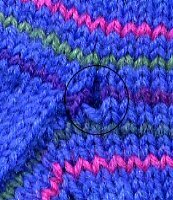 I call it a gape rather than a hole because it is actually an enlarged stitch rather than a space between stitches. I worked the socks with 5 double points and suspected that the gape was because I wasn’t circulating the stitches around the needles as I was working the gusset. I did this on the second sock and sure enough, no gape. The pattern is by Fiona Morris. She told me she planned to put it on her website eventually, but I haven’t checked to see if she’s been able to do that yet. I knitted them with Bernat Sox Nouveau! using solid royal blue and a variegated yarn in those lovely jewel tones. I'm averaging about two pairs of socks a year. That it! It is one of the main reasons that I haven't signed up for any knitting rings. I am just to unrelaible when it comes to knitting. January thru March are my knitting months. But weaving, that is another thing. I constantly have something on the loom, or just having come off the loom, or getting ready to go on the loom. Those socks are very nice. I'm sure that your dad will be pleased.